"This mining facility predates Installation Alpha by several hundred years. It was retrofitted to research possible offensive and defensive measures against the Flood. Indeed, I designed and oversaw the construction of this facility's various outbreak management systems." This gas mine was a large Forerunner structure suspended in the atmosphere of the gas giant Threshold, the planet around which Installation 04 orbited. It was an expansive automated facility that was created and used by the Forerunners and later, the Sesa 'Refumee's heretic faction. It was destroyed when it fell into Threshold and was crushed by the planet's gravity. It was one of many similar facilities on Threshold. A schematic of the gas mine. The gas mine was originally intended to be used to mine hydrogen, helium, and methane from Threshold's atmosphere. Hanging from a larger installation higher in the atmosphere, the mine was shaped somewhat like a grappling hook, with one center shaft and many legs bending down, and inwards it has three tubes extracting gas from Threshold. The station was divided into five modules: two gas refinement arms, each with its own cargo hangar, two laboratory modules for the research of the Flood, and the final module was the control section of the mine. Each of these modules could be accessed by catwalks or landing sites. The main cable was held in place by three equidistant holds on the top level; supposedly the holds could be released by the main control of the station. The inside of the gas mine was a curious mix of Forerunner aesthetic and factory, with dozens of moving energy conveyor belts carrying gas canisters about. There was a large gas storage hold, which was accessed by a large circular lift. This hold contained hundreds of canisters, most of which contain Flood. A series of three cables connected the mine to the larger structure overhead; this was a fail-safe in case of a Flood infestation. The gas mine was created by the Forerunners several centuries before the construction of Installation 04, with the sole purpose of mining gas from the atmosphere of Threshold. It operated on a completely automated basis for "untold centuries" with a resident contingent of Sentinels to maintain the facility. However, after the Flood was discovered, the Forerunners retrofitted several areas of the gas mine into laboratories to study Flood specimens. 343 Guilty Spark, the future monitor of Installation 04, personally oversaw some of these modifications. A few hundred years passed, however, with no successful defense against the Flood, eventually forcing the Forerunners to activate their weapon of last resort; the Halo Array. The gas mine was unaffected by the first activation of the rings and its contained Flood remained intact and untouched for over 100,000 years, until the year 2552. In 2552, the Fleet of Particular Justice stumbled upon the system when pursuing the UNSC Pillar of Autumn. The Prophet of Stewardship sent an artifact retrieval team led by Sesa 'Refumee and Loka 'Bandolee to the gas mine attempting to retrieve any useful Forerunner technologies they could find; however, at the conclusion of the Battle of Installation 04, the group found itself marooned on the mine. While there, the group encountered 343 Guilty Spark, having arrived into the gas mine from the remains of Installation 04. Listening to his words and finding out the truth about the Halos and the Great Journey, Sesa 'Refumee led a rebellion and began broadcasting their beliefs across Covenant communications channels, attracting the attention of other Covenant personnel, including the High Prophets. Dubbing his movement "Heresy", the High Prophets ordered Special Operations forces led by Rtas 'Vadumee and Arbiter Thel 'Vadamee to attack the gas mine and end 'Refumee's movement forever. Covenant forces deployed to the gas mine. The surprise attack went well; the Covenant forces were able to infiltrate the facility and pursue 'Refumee, destroying many heretic Banshees along the way. But complications arose when the Flood were released from their restraints by the Heretics, and overran the entire facility. The Flood multiplied quickly, infecting and killing most of the heretic forces, making it difficult for the Covenant to secure the facility. 'Refumee locked himself in the inner section of the mine, safe from both the Flood and an approaching maelstrom, but the Arbiter responded bluntly by cutting the cables holding the mine up, sending it into freefall. This forced the heretic leader to escape his hideout with an attempt to evacuate aboard a Seraph fighter, but the Arbiter caught up to him and they had a intense battle where he was killed. 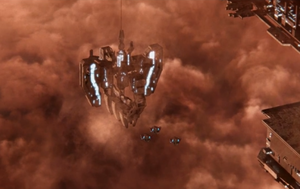 Shortly thereafter, Tartarus appeared in a Phantom, and he, the Arbiter, the special operations forces, and 343 Guilty Spark escaped the mine before it fell into Threshold's inner atmosphere, where it was subsequently destroyed. On The Oracle, if the player jumps just before the station is detached, the entire station will freefall out from under the player, sending them toward a kill barrier. Concept art of the gas mine above Threshold in the Art of Halo. Three Phantoms approaching the mine in order to eradicate Sesa 'Refumee's heretic faction. The gas mine, high above a storm raging on the planet Threshold. The gas mine from Halo 2: Anniversary. A platform exposed to Threshold's atmosphere. The tripe-cable system at the top level of the gas mine. The gas mine in free-fall. The gas mine in Threshold's atmopshere.